Speculation linking Burnley with a move for AIK Stockholm’s Swedish international winger Nabil Bahoui appears to be wide of the mark. The Clarets were reported to be pondering a loan deal for the 23-year-old wideman, born to Moroccan parents. I understand Burnley are aware of the player - who has also rumoured to have attracted interest from the likes of Everton, Sunderland, Southampton, Stoke City and Crystal Palace. But the club haven’t firmed up any interest in the £3m rated former IF Brommapojkarna man, as they look to more pressing areas within the squad to strengthen before the transfer window closes on Monday night at 11 p.m. - namely centre back and central midfield. As with Milan’s Italian striker Giampaolo Pazzini, linked with Burnley and a string of Premier League clubs recently, it appears Bahoui is keen on a move to England, but it appears Turf Moor won’t be his destination. 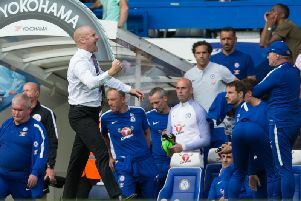 Clarets boss Sean Dyche was reported to have been spotted at Milan’s 1-0 defeat against Atalanta at the San Siro last Sunday, watching Pazzini, but he was not in attendance at the game. Meanwhile, Burnley are yet to receive any bids for eight-goal top scorer Danny Ings, amid reports that Tottenham Hotspur are set to offer £5m for the 22-year-old, who is out of contract in the summer. Both co-chairman, manager Dyche and Ings himself have stated throughout the month that he will stay put during the window, and assess his future between now and the end of his deal. Fellow striker Lukas Jutkiewicz has also been linked with a move away, on loan to Championship strugglers Wigan Athletic. Jutkiewicz - yet to score after a summer move from Middlesbrough - is expected back in contention for Saturday’s trip to Sunderland after missing the last two games with a cut on his foot, and Dyche ruled out any departures from his first team squad after the FA Cup exit at Spurs a fortnight ago: “Everyone knows how small a number we carry.